Well, there may still be snow on the ground, but Spring is here – and so is Spring Break! 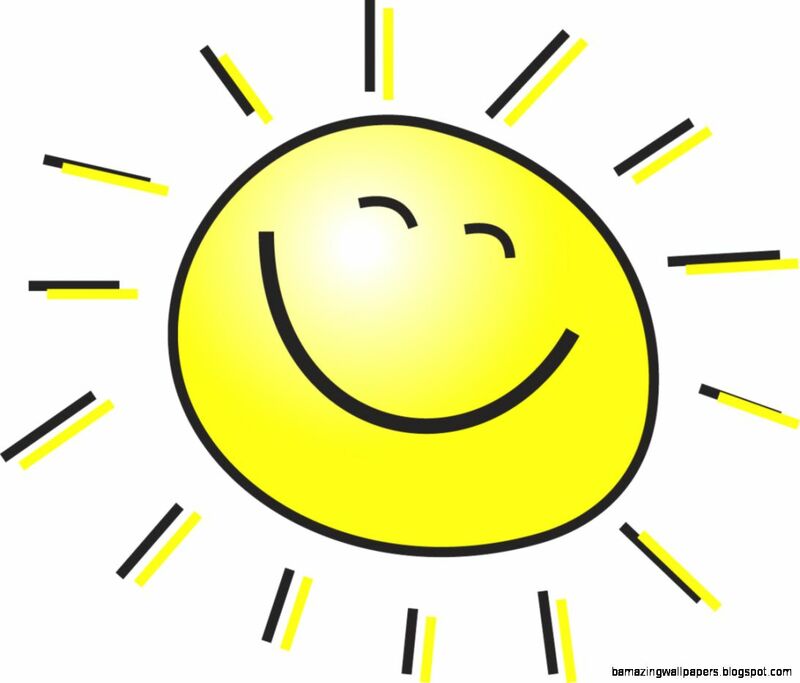 There will be no school starting this Monday, March 26th through Monday, April 2nd. Classes will resume Tuesday, April 3rd. Have a safe and enjoyable break. See you April 3rd! Olmsted Falls City Schools hosted a School Safety Forum this past Wednesday night at Olmsted Falls High School. Approximately 125 people were in attendance in the auditorium as OFCS Superintendent Dr. Jim Lloyd led the meeting, which featured an overview of key safety and security components in place throughout the district. Dr. Lloyd was joined by police and fire chiefs from both Olmsted Township and Olmsted Falls. The district’s School Resource Officer Joe English from the Olmsted Township Police Department was also in attendance, along with all building principals, members of the Olmsted Falls Board of Education and other elected officials. A general question and answer period followed Dr. Lloyd’s presentation. Attendees also had the opportunity to ask building-specific questions at smaller break-out sessions which took place in the cafeteria. OFCS extends our gratitude and thanks to our local safety forces for their participation in this event and for their ongoing partnership and support. We also thank all parents and community members who came out for this important event. For those unable to make it in person, the event was also streamed live on the school district’s official Facebook page. The video of this event will remain available there and can be viewed at any time by visiting www.facebook.com/olmstedfallsschools. Additionally, Olmsted Falls City Schools is part of the SaferOH Tip Line. SaferOH is an anonymous tip line service available 24 hours a day by calling or texting #844-SaferOH (844-723-3764). To learn more about the SaferOH Tip Line, please click HERE. Thank you to all for your continued support of Olmsted Falls City Schools. A group of approximately 40 local community stakeholders – including teachers, parents, high school students, Board of Education members, district administrators, local elected officials, business and community leaders, and representatives from post-secondary education – came together for the first in a series of three scheduled work sessions aimed at creating a “Portrait of an Olmsted Falls Graduate.” The first work session was held at Olmsted Falls Intermediate on the evening of Thursday, March 22nd. Led by OFCS Superintendent Dr. Jim Lloyd, the group will be engaged in formulating a description of the types of skills and attributes that all graduates of Olmsted Falls should acquire during their time in Olmsted Falls City Schools. The collaborative conversations will delve deep into the key elements needed to help students succeed in the world following graduation. 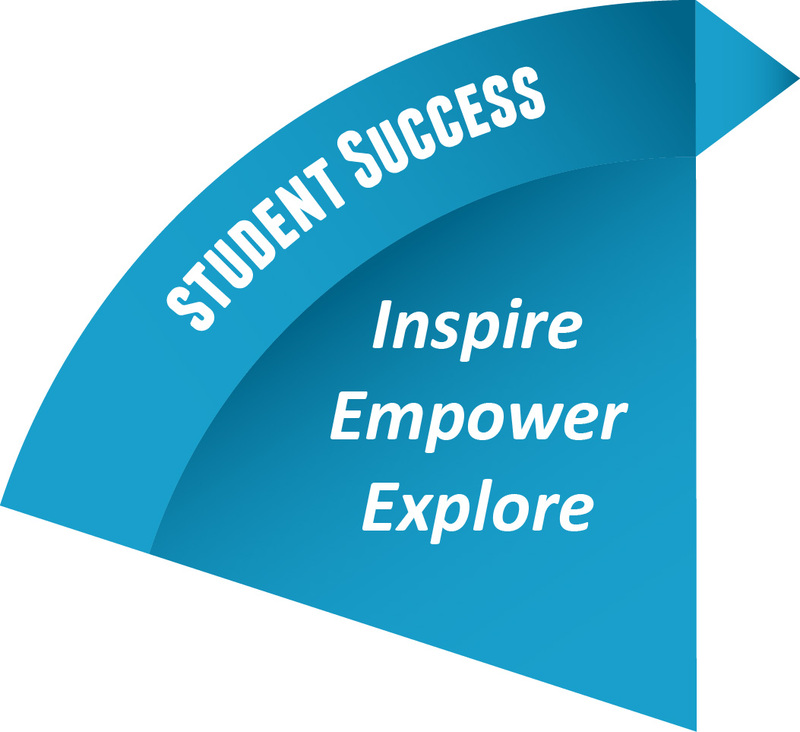 This important work is an extension of the district’s Strategic Plan and mission to provide experiences that inspire and empower students. Thank you to all those who participated in this week’s first Portrait of a Graduate work session! We look forward to sharing out additional information at the collaborative process continues. CURRENTLY UNDERWAY: We are excited to report that progress on the expansion and renovation of Olmsted Falls High School continues to gain momentum. While much of the work began behind the high school and was not visible from the street, passers-by and visitors to the campus in recent weeks have likely noticed evidence of construction preparations on the west end of the building where the music wing expansion is underway as well as the east side of the building where the new business classrooms will be constructed. Interested students, families and community residents can also view progress on the largest portion of the expansion, occurring behind the south side of the building by accessing the live construction webcam which has been set up to show the site of the brand new wing of classrooms being built in the open courtyard space currently adjacent to the south edge of the cafeteria. This new wing will include nine modern science classrooms as well as four art classrooms. When completed, this new wing will also eliminate any further need for the external classroom trailers, which will ultimately be removed. Tips for accessing the live webcam: Flash needs to be installed to run on Windows devices like Desktop PC’s and laptops. Flash cannot be installed on Chromebooks, So, the Web Cam will not work on Chromebooks. For additional information on the live OFHS construction webcam, please click HERE. HAPPENING NEXT: In addition to the expansion portion of the project outlined above, there are several significant renovation components taking place within the existing high school building. One of the most major areas to be renovated is the current kitchen, cafeteria and media center spaces. In order to ensure that these elements of the project are completed in time for the start of the new school year (in September 2018), work on this portion of the renovations will be getting under way during the spring break. By the time OFHS students return from spring break on Tuesday, April 3rd, the cafeteria and media center area will no longer be accessible. These areas will be walled off completely to allow renovation work to begin. Effective Tuesday, April 3rd, the building’s auxiliary gym will serve as the temporary cafeteria space through the remainder of the current school year. Food services will continue to serve the existing menu of food and beverage selections from the south side serving line through approximately April 13th, at which time kitchen operations will officially move from the high school to the intermediate school. At that time, an adjusted menu of available food items will be transported to the high school daily. OFHS students and families will receive additional information as this transition occurs. CONTINUED APPRECIATION: Olmsted Falls City School District continues to be sincerely grateful to our school community for passing the November 2016 bond issue, which made this much-needed expansion and renovation possible with a zero increase in taxes. We are also incredibly thankful for the continued cooperation of our current OFHS students and staff. Anyone with questions about the current expansion and renovation projects underway at Olmsted Falls High School is encouraged to reach out to OFHS Principal Holly Schafer (hschafer@ofcs.net) or OFCS Superintendent Dr. Jim Lloyd (jlloyd@ofcs.net). We are happy to talk to students, parents and community residents about the project. The students of Falls-Lenox surpassed their expectations. They demolished their own Right-to-Read Week goal of 62,075 minutes! During last week’s Read-A-Thon, they read more than 66,997 minutes! Top classes who read the most (Teachers Kostraba, Dame, Payne) earned a class set of books from Scholastic to add to their teacher’s library. They also raised an impressive $3,950 to help their school and PTA provide literacy opportunities to students. You may help push the school to $4,000 since there is still time to donate through March 28. 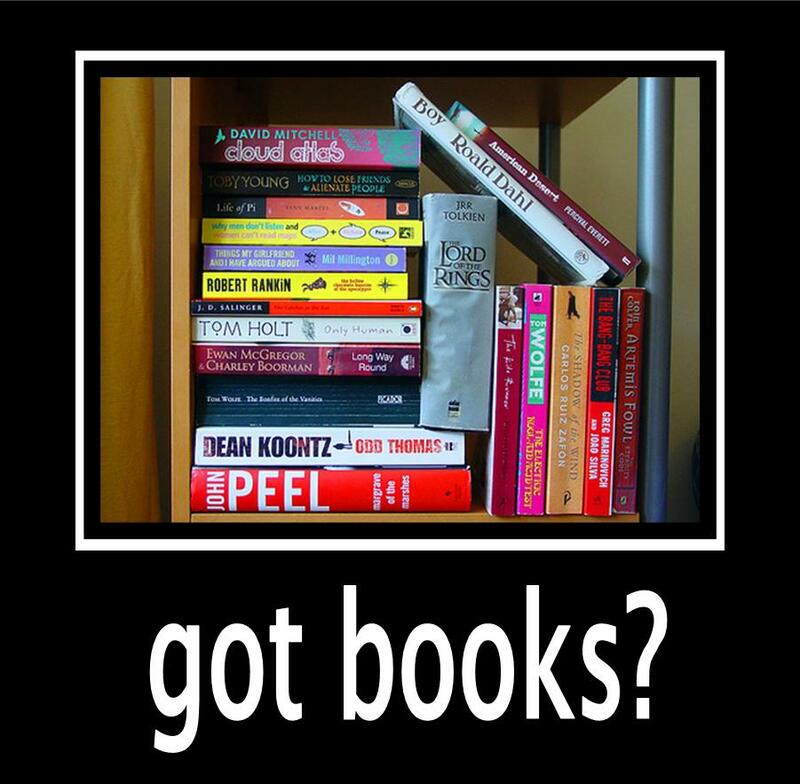 Simply click HERE and select “Donate directly to the group.” We are so proud of all of our readers and thank the caregivers at home for encouraging their children to read. “Reading to the mind is what exercise is to the body.” – Joseph Addison. On Friday Falls-Lenox hosted an after-school Read-A-Thon Reading Session. More than 70 first- to third-graders attended. 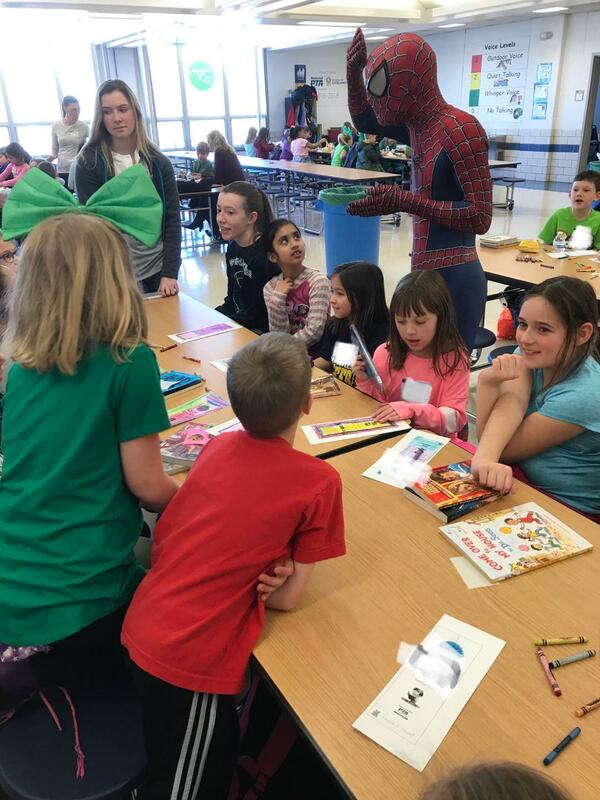 There were guest readers and helpers, including Olmsted Falls Fire Chief Chad Gluss and his team of firefighters, as well as two OFHS students, Sophie K. and Becca A. Spider-Man came by to encourage our readers, too! Each student logged 75 minutes of reading and there were chances to win raffle prizes! Thank you to all who participated! 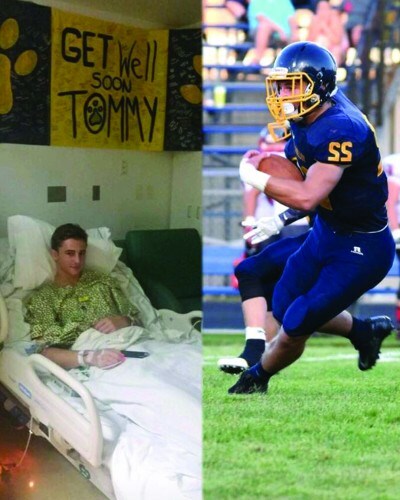 Tom Pettry accidentally discovered he had a carcinoid tumor after suffering a concussion on the football field and an emergency appendectomy the next day. To view the inspiring article, click HERE. Congratulations to six Bulldog students who were selected into the Polaris Satellite National Technical Honor Society. The six are Taylor Jones, biomedical science; Joseph Backus, engineering; Michael Borovich, engineering; Chase Fernkorn, engineering; Cole Zehe, engineering and Natalie Partin, teaching professions. The induction will occur at 6 p.m. April 17th at Strongsville High School. Students from other schools within Polaris’ jurisdiction also will be inducted. Congratulations to all selected students! CONGRATULATIONS TO OFHS WINTER SCHOLAR AND 1ST TEAM ATHLETES! Seventeen OFHS winter athletes have earned Scholar Athlete or 1st Team All Conference recognition this season. To read the announcement and complete listing of all winter Scholar Athletes from OFHS Athletics Department, please click HERE. To read the announcement and complete listing of all winter 1st Team All Conference Athletes from OFHS Athletics Department, please click HERE. Congratulations to all of these outstanding student athletes! More than 140 OFHS students were recognized at this year’s 38th Annual OFHS Honors Banquet held at Baldwin-Wallace College on March 8th. Students were joined by their families for the event, which included dinner followed by the recognition of students. To view the complete program from the event, which includes the names of all students honored, please click HERE. To view a photo gallery from the event, please click HERE. Congratulations to these outstanding student scholars! THE ODDS ARE – GUYS AND DOLLS MUSICAL COMING TO OFHS APRIL 13TH & 14TH! The talented Olmsted Falls High School Masquers will present the Guys and Dolls as their spring musical production on April 13th and 14th in the OFHS auditorium. Both performances will start at 7:30 p.m.
Tickets are $10 for adults, $7 for students/senior citizens. To pre-order tickets, please call 427-6070. All those interested in cheerleading should attend the 7:30 p.m. April 10th informational meeting in the Olmsted Falls Intermediate School cafeteria. 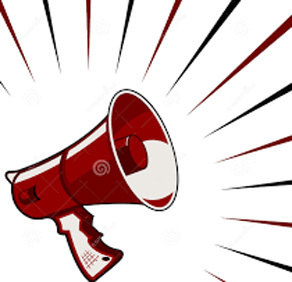 The mandatory cheerleader clinic is from 6:30-8:30 p.m. April 24th in the OFHS auxiliary gym. Tryouts start at 8:45 a.m. April 28th in the OFHS gym. The Parent meeting for the 2018-2019 cheer squads is at 7:30 p.m. April 30th in the OFIS cafeteria. If you have questions, email Coach Danielle at ofhscheerleading@gmail.com. For a detailed flyer, click HERE. Hurry! The OFIS Malley’s candy sale ends this Monday! All proceeds will be used to offset the cost of our annual class trip to Greenfield Village and The Henry Ford Museum in Dearborn, Michigan during the spring of your child’s 5th grade year. · This is an ONLINE only candy fundraiser. Friends and family can order at their convenience 24 hours a day. · All orders totaling $65 or more to one address receive FREE SHIPPING. · ONLINE order deadline is Monday, March 26. Check out Olmsted Early Childhood PTA’s online auction fundrasier now through March 31st! Visit http://www.32Auctions.com/OECPTA to check out a great selection of items to bid on. AUCTION CLOSES AT MIDNIGHT ON SATURDAY, MARCH 31ST! All proceeds benefit the OECPTA! 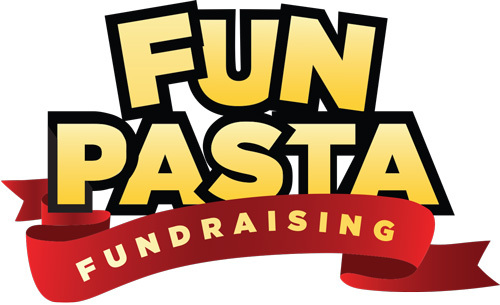 The OFHS Athletic Boosters and the Bulldog tennis team are sponsoring a “Pasta Fundraiser” through April 3rd. 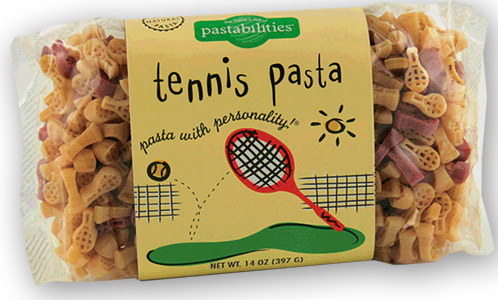 The pasta, made in the U.S.A., offers such shapes as tennis rackets, basketballs, volleyballs, snowmen, baseball gloves, runners, shoes and such themes as OSU Buckeyes, tailgate and celebrate pasta, down on the farm mac and cheese, zoo animals, music, angel hair and others. The online sales will be shipped directly to you and all sales in person will have the items shipped to the team, with members delivering them. Any sales after the tennis team date will continue to be credited to the Athletic Boosters account for an additional 30 days. The team boosters will receive 40-percent of all sales. Proceeds will go toward the programs and much-needed indoor court time and new tennis equipment. For more details about the fundraiser on the Bulldog athletic page, click HERE. To go directly to the online fundraiser, click HERE. Saturday, April 7th from 8:30 am till 2:30 pm. Savers will compensate OFMA based on the number of pounds of cloth items collected. CANNOT ACCEPT HOUSEHOLD ITEMS, TOYS OR ANY ITEMS NOT CLOTH. All donors will receive a tax-deductible receipt! Bring items to be donated in plastic bags or boxed. 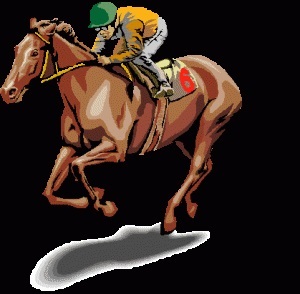 The annual Olmsted Falls Athletic Boosters’ Night at the Races is on Saturday, April 14th. Booster members invite everyone to come and support its organization. This event is one of its largest fundraisers of the year. All funds raised go directly back to all of the athletic organizations in our district grades 7 – 12. For tickets, contact Brian Fritz at 216-337-4422. To purchase a horse, contact Terry Atkins at terenceatkins22@gmail.com. In addition, the group has sent a merchant letter. If you work for a company that makes donations to non-profit organizations, please present your employer this letter for a donation. See the attached flyers for more information. Come on out for a good time while helping our athletic programs – we look forward to a fun night! GO BULLDOGS! Wild and crazy ideas become reality in this year’s all-new Camp Invention program, Fast Forward! Campers in grades K-6 explore the technology behind self-driving cars and create vehicles of the future, build their very own “smart” homes, design a mechanical robot dog and take home an Optibot, a robot that senses dark and light surfaces. Local educators lead the week of fun, hands-on, STEM activities that allow children to think big, explore their curiosity, and never give up! Camp will run the week of June 11-15. Early registration discounts are available, so don’t delay. Visit campinvention.org or call 800.968.4332 to register. Use promo code Ideas25 to save $25, which expires this Friday, March 23rd. To download a Camp Invention flyer, please click HERE. Contact Brianna Smith at bsmith@ofcs.net with any questions. Don’t miss this opportunity to attend the next Kiwanis Club Pancake Breakfast! The Olmsted Community Summer League (OCSL) offers baseball and slow-pitch softball leagues/games for boys and girls ages 4-18. We accept kids of all skill levels and require little to no travel. To register, visit the Olmsted Community Center website by clicking HERE or in person at the OCC on Mapleway Drive. Registration after March 31st will incur a $20 late fee and will only be accepted until April 15th. Please like OCLS on Facebook for frequent updates and news about our league. We look forward to seeing you on the ball fields. Any questions, contact OCC at 440-427-1599. Join us on our journey to the Enchanted Forest where we meet 12 dancing princesses on their quest to find adventure and love. Next, meet our prince and fairies as they mount a daring magical rescue to save Sleeping Beauty from a fairy who has gone astray. And last, but not least, Join Ella, who despite her difficulties, learns the magic of kindness and believing in the beauty of her dreams, and that all problems can be solved with a good pair of shoes. The performances are held at Elyria High School Performing Arts, 600 West Avenue, Elyria, Ohio 44035. The Falls Pointe Swim Team sign-ups will be held on April 28th from 12:00 to 3:00 p.m. at the Falls Pointe Clubhouse. Online registration begins April 8th. The team is open to any Olmsted Falls/Township resident ages 4-18 who can independently swim the length of the pool. Members love to have fun as much as they love to swim. It is a low pressure environment for swimmers of all levels with many fun activities included. For more information and online registration, go to Fallspointeswimteam.com. Olmsted Community Preschool Registration for the 2018-2019 school year is officially underway. The preschool offers morning and afternoon classes for 3, 4, and 5 year olds. For more information, contact Melanie Reynolds, 440-235-3869 or ocprschol@aol.com The preschool is located at 7853 Main Street in Olmsted Falls. Olmsted Falls Lacrosse Association is excited to announce a new component to our developmental lacrosse program – Adaptive Lacrosse! This program will run during the standard lacrosse season (March – May) and is designed to allow individuals with developmental disabilities to learn about and participate in the game of lacrosse. If you or someone who you know is interested in learning more about this opportunity, please contact Jodi DeMarco at joannademarco@yahoo.com or 440-503-3090. All are welcome, this is not limited to Olmsted Falls. Olmsted Falls City School District will host an informational meeting on school safety and security at 7 p.m. TONIGHT, Wednesday, March 21st at Olmsted Falls High School. OFCS district and building administrators will be joined by our local safety officials from both Olmsted Township and the city of Olmsted Falls to talk about school safety/security measures and practices. This special meeting is open to all parents, staff and residents of Olmsted Falls City Schools. All Olmsted Falls City School District buildings will be closed today due to inclement weather and road conditions. Olmsted Falls City School District will host an informational meeting on school safety and security at 7 p.m. this Wednesday, March 21st at Olmsted Falls High School. 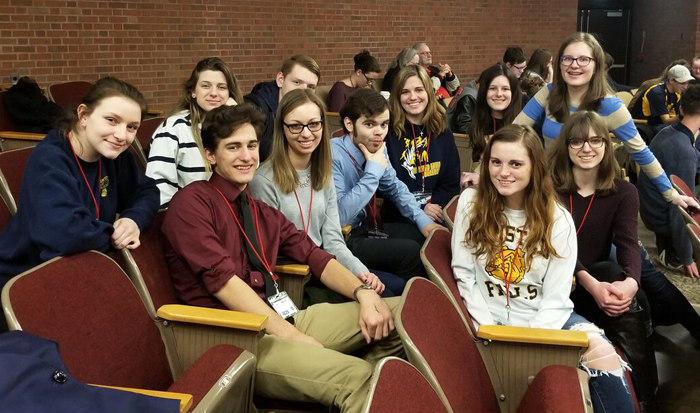 Congratulations to the OFHS PenOhio varsity team who took first place overall in the recent PenOhio competition! 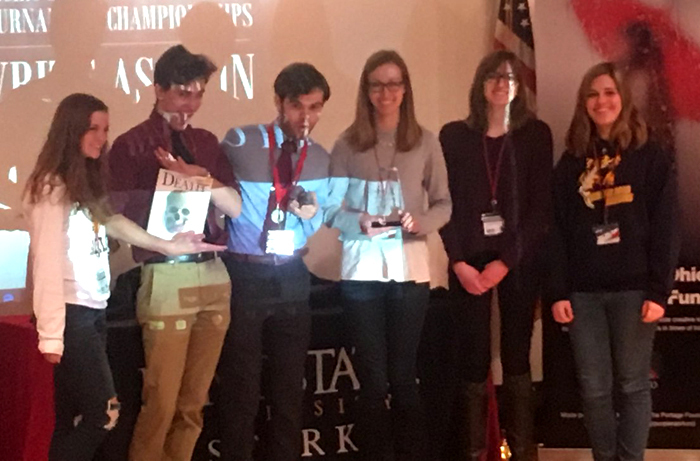 Individual winners in that division were Camryn Hassel, first place; Lauren Gumeny, third place and Jake Wrege, sixth place. Camryn also received a $1,000 scholarship to Kent State University. Remaining members of the varsity team are Nicole Egel, Jared Brancatelli and Emma Andrus who also scored very well. Congratulations again to all of these talented writers! Last week Falls-Lenox School observed College and Career Awareness Week. Each day students attained information about a new career and participated in fun activities to bring awareness about different careers, including sending their favorite stuffed animals to work with their parents. The students shared their stuffed animal’s experience with their classmates. The week ended with the third grade students attending Third Grade Career Day. Parents, friends and family represented 42 careers as they took time from their busy schedules to share, inspire and motivate students. All speakers inspired the students to work hard and set goals so they can have a rewarding career in the future. The speakers also linked their conversations with the third grade economics unit. Students explored the concepts of goods, services and competition. We appreciate all of the time and energy the speakers put into their presentation. Positive energy and motivation were beaming from the students as they left that afternoon. 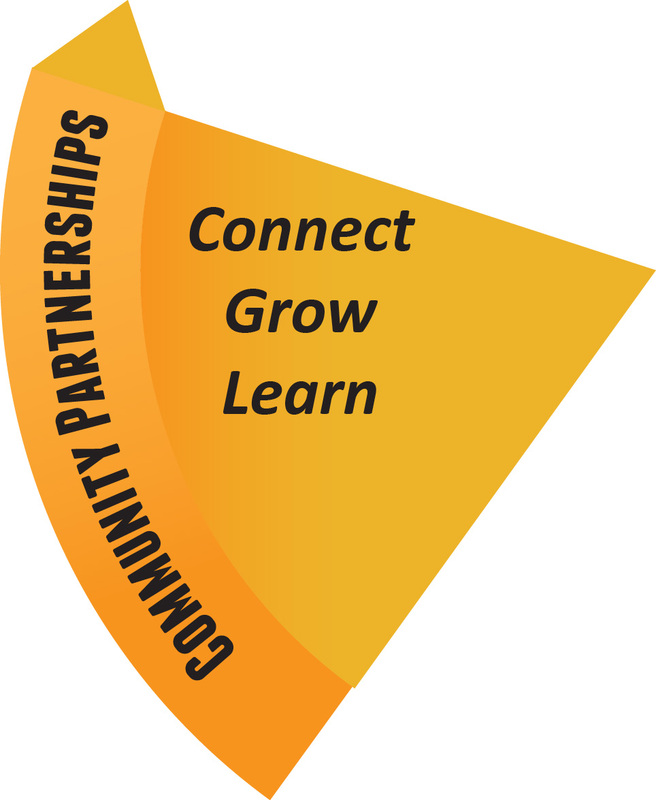 The goal of the College and Career Awareness Week activities is to help students make connections between skills taught at school and skills needed in the real work world. To view a photo gallery of the week, click HERE. Bulldog families and coaches now have a new way to conveniently connect to athletic training services available through a partnership with Southwest General Hospital. For additional details on this new service, click HERE now for the article on the Bulldog athletics website. 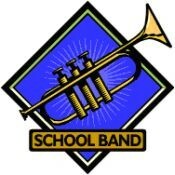 The OFHS Band will compete at States to be held at North Royalton High School on April 20th & 21st. The Wind Symphony performs and competes at class AA which is the highest level of band literature available for high school students and the Wind Ensemble performs at a Class B. The competition is free and open to the public. Questions about performance times can be emailed directly to OFHS Band Director Mrs. Julie Budd at jbudd@ofcs.net. The OFHS Women’s Choir, Bel Canto Choir, under the direction of Mrs. Joy Kiedrowski, also made it to States and will perform at Highland High School on April 21st. Additionally, the OFHS Wind Symphony will be performing alongside Kent Sate University’s top ensemble on May 4th at 7 p.m. They were selected for this honor by being one of the top ensembles in North East Ohio – a great honor for our music program, and a reflection on the fantastic students. This concert is also free and open to the public and will be held at Cartwright Hall in Kent State University. Finally, speaking of Kent State…. Congratulations again and continued good luck in your performances ahead! The OFHS Brass Quartet of Joe Bertrand, Dan Fidler, Catie Shambaugh, and Matt Strum kicked off this month’s Board of Education meeting by playing the 3 minute chamber piece that recently earned them a Super Rating. The extremely difficult piece was very impressive and enjoyed by all in attendance. Well done! Thank you to OFMA for gathering such a wonderful collection of music news each month! There is certainly no shortage of information to share! The 2018 OFMA Summer Music Camp Scholarship application is available to download. OFCSD students currently in grades 4 thru 12 are welcome to apply. Applications are due to your music teachers by Friday, March 23rd. Please click HERE to download the application. Please note that Olmsted Falls City Schools has made a change to the current school year calendar relating to the May 8th election day. There will be NO SCHOOL FOR STUDENTS ON TUESDAY, MAY 8, 2018. Staff members will report for a district-wide staff development day. In an effort to maximize the safety of our students, Olmsted Falls City Schools has decided to cancel school for students during the spring election day in addition to the normal fall election closure each November. OFCS will use this day as a staff development day for all staff. The current 2017-2018 OFCS School Year Calendar has been updated to reflect this mid-year change and can be accessed by clicking HERE. Please mark your personal family calendars with this important change. Thank you. The annual Malley’s candy sale continues at Olmsted Falls Intermediate School! All proceeds will be used to offset the cost of our annual class trip to Greenfield Village and The Henry Ford Museum in Dearborn, Michigan during the spring of your child’s 5th grade year. Mark your calendars for the annual Olmsted Falls Athletic Boosters’ Night at the Races on Saturday, April 14th. For tickets, contact Brian Fritz at 216-337-4422. To purchase a horse, contact Terry Atkins at terenceatkins22@gmail.com. In addition, the group is sending out a merchant letter. If you work for a company that makes donations to non-profit organizations, please present your employer this letter for a donation. See the attached flyers for more information. IT’S NEVER TOO EARLY TO START THINKING ABOUT SUMMER: CAMP INVENTION IS CALLING ALL CAMPERS & INVENTORS! Camp will run the week of June 11-15. Early registration discounts are available, so don’t delay. Visit campinvention.org or call 800.968.4332 to register. Use promo code Ideas25 to save $25 (expires 3/23). Olmsted Falls City School District will host an informational meeting on school safety and security on Wednesday, March 21st at 7:00 p.m. at Olmsted Falls High School. OFCS district and building administrators will be joined by our local safety officials from both Olmsted Township and the City of Olmsted Falls to talk about school safety/security measures and practices. This special meeting is open to all parents, staff and residents of Olmsted Falls City Schools. State lawmakers are considering Ohio House Bill 512. This bill transfers nearly all of the duties and authority of the State Board of Education and the superintendent of public instruction into a new state agency that would exercise far too much power. The bill would eliminate the procedures that now are in place that allow input from students, parents, teachers, administrators, schools, school districts, superintendents and local school board members. Dr. Lloyd, and other area school leaders, believe that sidesteps representative government on which our country’s principles are founded. The bill also encourages educational decisions that will be politically motivated – and with very little public input. His entire post may be found on his Superintendent’s Update by clicking HERE. Senator Matt Dolan – District 24 – Call (614) 466-8056 or click HERE to email Senator Dolan. Representative Thomas Patton – District 7 – Call (614) 466-4895 or click HERE to email Representative Patton. OFHS student Nicole E. is one of the top 20 finalists in the Young Entrepreneur Institute’s Teen Pitch Tank. She needs your online vote for her SmarTrivet product! Her SmartTrivet targets men and women to make conscious decisions while cooking and charging their phones to prevent home fires and maximize productivity in the kitchen. The product’s spiral design inside each piece allows it to transform into a phone stand, a large trivet, two smaller trivets, a wine rack, decor and more to meet various needs. According to her video, the National Fire Protection Association said electrical malfunctions within cooking and kitchen equipment and other electronic equipment caused nearly 70 percent of home fires between 2010-2014. That resulted in 20 civilian deaths, 190 civilian injuries and $659 million in property damage. Her invention will help eliminate those statistics while allowing maximum productivity in the kitchen. PLEASE CLICK HERE and scroll down to find the title “SmarTrivet” to view Nicole’s video and VOTE for her project! She needs your vote by March 13th to win. Help this OFHS business student win the competition and make her invention a part of the market place! Well done Nicole! 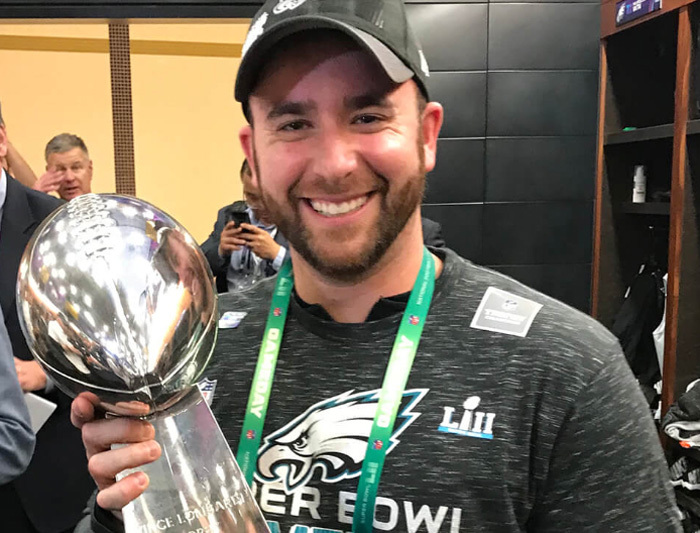 Ryan Maddocks, a Bulldog and Bowling Green State University grad, got to hold the Vince Lombardi Trophy following the Philadelphia Eagles’ Super Bowl LII win. He is the Eagles’ video assistant. He grew up loving football – and videography – through his local family and his dad’s routine of recording family holidays and vacations with his camcorder. BGSU describes Ryan’s experiences from his Bulldogs days through his college years and at his current job in an article that may be viewed by clicking HERE. Congrats, Ryan. We wish you continued success in your career. 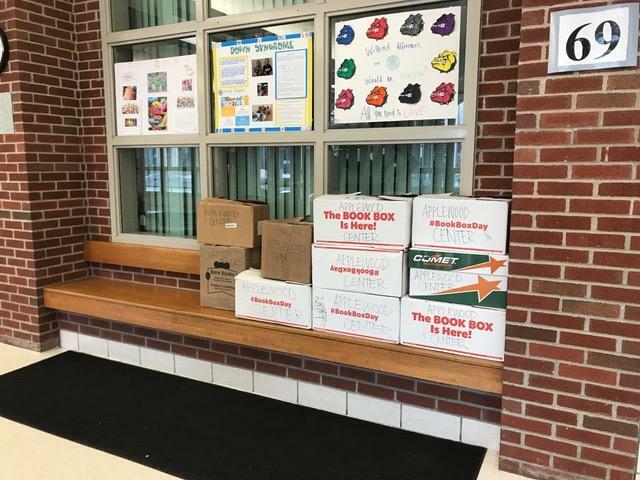 During Right-to-Read Week, Falls-Lenox students donated hundreds of books for the After School programs at Applewood Centers, Inc. The centers service those 6 l/2 to 17 years of age who have behavioral and emotional needs within Cleveland and Lakewood area schools. FLECCPTA organized and coordinated the drive while the school’s Kiwanis Terrific Kids sorted and organized the books for pick up. Julie Jackson, a resident who works at Applewood’s After School program, was very appreciative and said her kids will be excited with the new books. Kudos to Falls-Lenox for working to make a difference in the community! The Early Childhood Center Book Fair continues to run through tomorrow, Friday, March 9th in the school’s music room #113. Children will be able to shop during their regular afternoon library time. Those unable to stop by ECC or would rather shop from the convenience of home, may go online now through March 10th by clicking HERE. The OFMS Media Center is hosting a Scholastic Book Fair that is now occurring and will continue through March 16th. It is open from 8:30 a.m. to 3:30 p.m. The fair is stocked with tons of new and exciting books such as, extraordinary heroes, edge-of-your seat reads, teem drama and, of course, popular picks. Hope to see you there! The FL/ECC PTA’s Read-A-Thon event will be taking place March 9-March 18 for Falls-Lenox Primary School. This online fundraiser helps the FL/ECC PTA have the funds to purchase books given to each student (1st-3rd grade) during Right to Read Week. Please consider setting up your 1st-3rd graders account, logging minutes they read and asking friends and family to sponsor your reader online. We are trying to beat the record for minutes read that the school set during Right to Read Week so it is important that minutes read are logged under your child’s Read-A-Thon account. An information sheet with website and the students’ personalized access codes came home March 2. A reminder sheet with the same information and reminder wristband will come home March 9. FL/ECC PTA appreciates your support and hope you will accept the reading and fundraising challenge! It is Malley’s candy time at Olmsted Falls Intermediate School! All proceeds will be used to offset the cost of our annual class trip to Greenfield Village and The Henry Ford Museum in Dearborn, Michigan during the spring of your child’s 5th grade year. Don’t miss this year’s annual OECPTA Bargain Bonanza taking place on Saturday, March 10th from 8:00 a.m. to 2:30 p.m. at Olmsted Falls Middle School. Olmsted Community Baseball & Softball Commission (OCBSC) is seeking 3 seasonal employees to work on a team that will be responsible for preparing and maintaining baseball/softball fields for the upcoming season (late April through July). Roles available include a Field Crew Chief and Field Crew Workers, and more information about each role can be found here. All employees must be at least 18 years of age. If you are interested, please send a resume to Lillian Faust at obscfslf@gmail.com before March 16, 2018. Once a parent has completed the online portion of the process, they will be able to schedule the required in-person appointment. Again, in-person registration appointments for incoming kindergarten students for next year are taking place THIS WEEK on March 6th and 7th. If you have an incoming kindergarten student or know someone who does, please make sure that online registration has been completed and that your appointment has been scheduled for next week. Should you have questions, please don’t hesitate to contact the Early Childhood Center at 427-6360. We look forward to welcoming our new class of Bulldogs! Please note that Olmsted Falls City Schools will be making a change to the current school year calendar relating to the May 8th election day. There will be NO SCHOOL FOR STUDENTS ON TUESDAY, MAY 8TH. Staff members will report for a district-wide staff development day. We are currently updating the 2017-2018 OFCS School Year to reflect this mid-year change and will provide a follow-up link in the next blog post. Olmsted Falls High School students in Career Tech programs competed Saturday at the Regionals SkillsUSA Competition held at Tri-C West. Three students placed well in the event. Senior Clarissa Rosa came in first place in Crime Scene Investigation. Taking second place were Skyler Dougher, senior, in Job Interview and Marissa Kuehn, grade 9, in Technical Drafting. Marissa is seen in the photo to the left. Congratulations to these students and all who competed in the competition. The Kind Kid Award from Connecting for Kids is awarded annually to a child under 13 years of age who demonstrates kindness and compassion to peers. 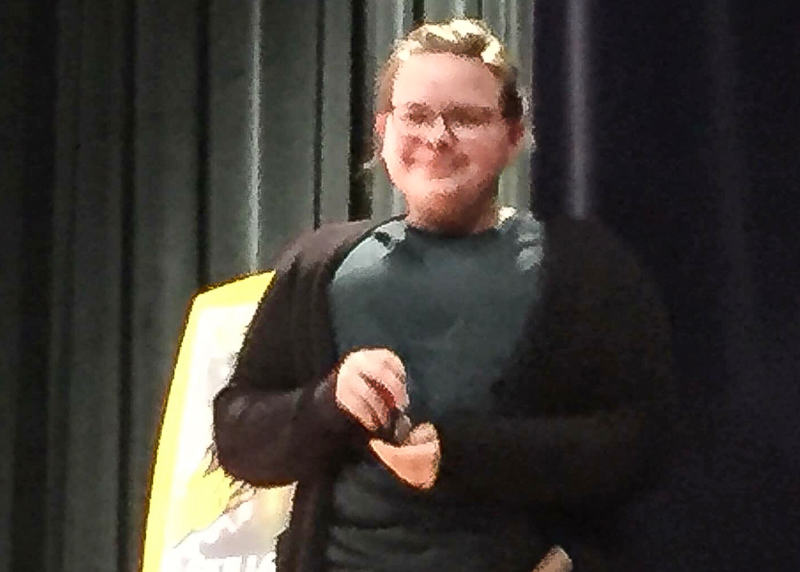 This year’s winner, Kyleigh Briggs, has continually volunteered for intervention student counseling at Olmsted Falls Schools and is the person who raises other children’s spirits when she finds them needing it, both friends and strangers. Kyleigh even hosted an iced tea stand to raise over $150 for Kick-It for Cancer. She is always encouraging her family to visit the elderly in the nursing home because she tells them, “It’s the right thing to do” which, according to her nomination, has been her slogan since she learned to talk. Kyleigh cares for all people and for the well-being of animals too. Kyleigh was honored at the Connecting for Kids Annual Fundraiser held on February 23rd. Congratulations Kyliegh! Bulldog country is proud of you! The Early Childhood Center Book Fair starts TODAY, MONDAY, MARCH 5TH and runs through Friday, March 9th in the school’s music room #113. Children will be able to shop during their regular afternoon library time. Families are invited to shop from 5-7 p.m. Tuesday, March 6th at the event. Those unable to stop by ECC or would rather shop from the convenience of home. may go online now through March 10th by clicking HERE. The OFMS Media Center is hosting a Scholastic Book Fair that will run today – March 5th through March 16th – and open from 8:30-3:30. The fair will be stocked with tons of new and exciting books such as, extraordinary heroes, edge-of-your seat reads, teem drama and of course popular picks. Hope to see you there! Students designed, planned, raised funds and now built the structures to raise awareness to Hunger. Students raised over $1,900 to cover the cost of the structures after the structures stand in the Polaris commons the structures will be dismantled and taken to Christians in Action in Olmsted Falls. Three structures were built representing Terminal Tower, Key Tower and the American Flag. OFHS students who participated in this project would like to thank Key Bank, Candi (Tower City), ShurTech (Duck Tape), Olmsted Falls Kiwanis, Arconic Foundation, Spoon Blossoms, Reitz Family, Martin Family, and Haydn Family. To read media coverage about the “Canstruction” project on Cleveland.com, please click HERE. OFHS CELEBRATES ENGINEERS WEEK 2018! Every Year Students in the Engineering classes at Olmsted Falls participate in Engineers Week February 18th thru 25th. Engineers Week promotes recognition among parents, teachers, and students of the importance of a technical education and a high level of math, science, and technology literacy, and motivates youth, to pursue engineering careers in order to provide a diverse and vigorous engineering workforce. Each year, EWeek reaches thousands of schools, businesses, and community groups across the U.S. This week our students built paper plate marble tracks and mousetrap cars, as well and the canstruction project (detailed above). 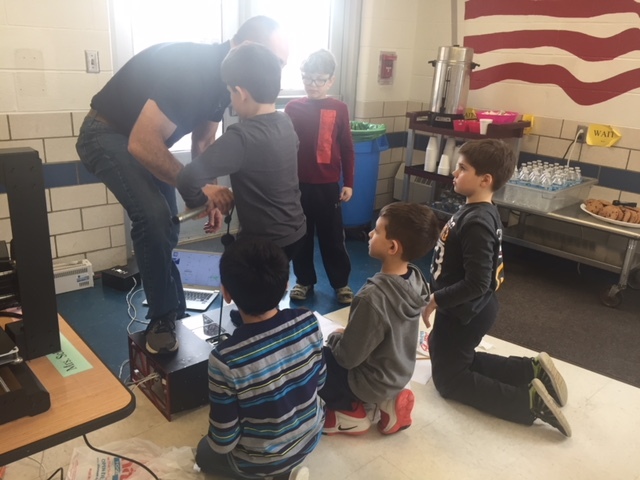 To view additional photos from Engineers Week activities at OFHS, please click HERE. 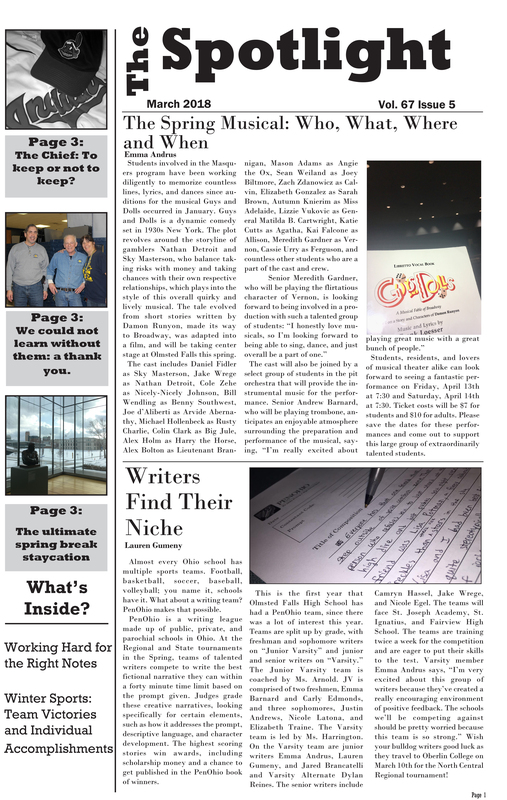 The top story of this month’s OFHS Spotlight highlights the Masquers’ Spring play, Guys and Dolls, with performances on April 13th and 14th. Other stories include the school’s first PenOhio writing team, upcoming band and choir competitions, the hard-working staff of custodians and cafeteria workers, winter sports and others. To view the March Spotlight, click HERE. On February 12, 2018 FL/ECC PTA hosted a Take Your Family to School Week Information (TYFTSW) night at Falls-Lenox as part of a grant awarded by National PTA. At the event, those in attendance viewed a video presentation containing information from each of the school’s building principals. In addition, the link to this video presentation was shared in order for all parents and caregivers of students at Falls-Lenox and ECC to access the information. We understand that families are busy and evolving and FL/ECC PTA desires to meet each family where they are and we hope that each parent/caregiver is able to view the video and gain the valuable information that can help them help their children. This brief survey will help PTA better understand how to meet your needs in the future as we consider planning events at school as well as delivering information electronically. We also want to know what topics you would like to learn more about in regards to partnering with you to help your child. Thank you in advance for your time. To complete the online survey now, please click HERE. All surveys returned by midnight, March 5, 2018 will be entered to win a $50.00 family prize from PTA. Thank you to all those who attended the event and those who have already viewed the video. We’ve received positive feedback on the project! 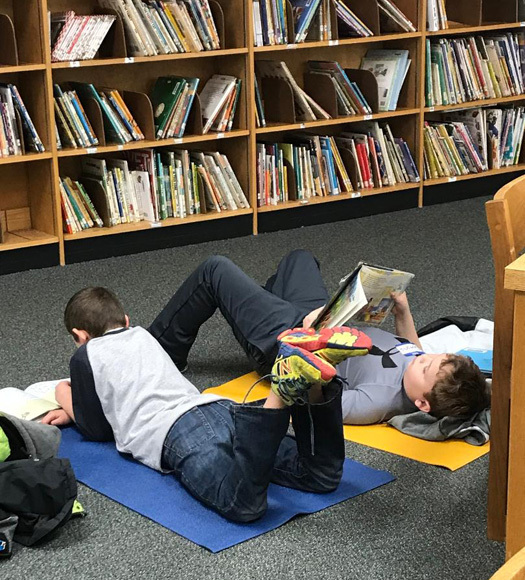 The Read-A-Thon will be taking place March 9-March 18 for Falls-Lenox Primary School. This online fundraiser helps the FL/ECC PTA have the funds to purchase books given to each student (1st-3rd grade) during Right to Read Week. Please consider setting up your 1st-3rd graders account, logging minutes they read and asking friends and family to sponsor your reader online. We are trying to beat the record for minutes read that the school set during Right to Read Week so it is important that minutes read are logged under your child’s Read-A-Thon account. An information sheet with website and the students’ personalized access codes came home March 2. A reminder sheet with the same information and reminder wristband will come home March 9. FL/ECC PTA appreciates your support and hope you will accept the reading and fundraising challenge!